Uttar Pradesh ended with around 53 per cent of over 94 lakh voters exercising their franchise across 26 districts during third and final phase of Urban Local Body polls. LUCKNOW: Amidst reports of bogus voting, missing names in voters’ list and ruckus created by the candidates and voters, the battle for local governance in Uttar Pradesh ended with around 53 per cent of over 94 lakh voters exercising their franchise across 26 districts during third and final phase of Urban Local Body polls on Wednesday. The results will be declared on Friday, December 1. This overall percentage of all the three phases together stood at 52.5 per cent registering a jump of 6 per cent as compared to the last polls which witnessed 46.2 per cent voting in 2012. While in first phase, the voting percentage remained 53 per cent against 46 per cent in 2012, the second phase saw 48 per cent against 41 in 2012 civic polls. The last phase witnessed a keen contest in 233 local bodies including five municipal corporations Saharanpur, Jhansi, Bareilly, Firozabad and Moradabad, 76 Municipal Boards and 152 town areas across 26 districts. Of five mayoral seats, three—Jhansi, Firozabad and Moradabad—were won by the BJP in 2012, while Bareilly was won by the Samajwadi Party. Saharanpur was declared a municipal corporation in October 2009 but elections could not be held in 2012 in the absence of delimitation of wards. As per the breakup presented by the State Election Commissioner, 41.26 per voters turned up during the three phases to exercise their franchise for 16 municipal corporations, 58.15 per cent for 198 municipal boards and 68.3 per cent voters cast vote for 438 town area bodies. The figures clearly indicate that the voters of town areas showed much greater interest in electing the local government than the big cities recording a difference of 27 per cent in total turn out. On the issue of faulty or tempered EVMS, State Election Commissioner SC Agarwal rejected the charge vehemently claiming that only 0.7 per cent of EVMs were replaced during the three phases of polls. “However, the rule book allows 2 per cent replacement of EVMs. 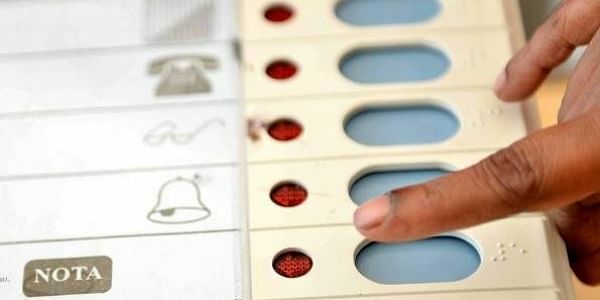 Total 32,374 EVMs were deployed, of which, 513 machines developed technical snag and had to be replaced,” said Agarwal adding that of 513, 250 were replaced in state capital Lucknow. “The complaints against the EVMs by the candidates and parties were not true as they were not backed by the booth-by-booth data by the commission,” asserted the SEC. In the third and final phase, only 37 EVMs were replaced. On the complaints of names missing in voters’ list, the SEC claimed that a commissioner level probe was ordered in the state capital to look into the complaints of missing names and erring voter lists. He attributed it to duplicity of names in several lists of local bodies and the delimitation. “After delimitation, the booths of the voters were changed. So they might not have found their names in the lists at booths they had been voting earlier,” the SEC maintained.